Welcome to GENESIS STUDIOS! Our 25th Year! FOUR Partners Under ONE ROOF to Meet All Your Communication Needs! We’re celebrating 25 years of doing what we do to help others know what you do so you can do what you do for them without worrying about what we do for you so you can do what you do better. That’s what we do! 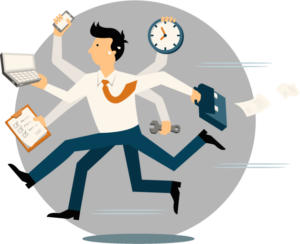 as you work with multiple agencies and vendors to manage your communication needs, all the while hoping that the divided messages are cohesive and on-point. You can pay your creative team good money to develop an awesome media campaign only to find out too late that the project scope exceeds your budget. Or you can partner with Genesis–your one-stop communication resource–to manage the graphic design, video production, web development, distribution, and all the many aspects of your advertising and communication needs under one roof and develop an effective strategy from start to finish with your budget in mind. I love Genesis! I love the people! I love the work ethic! No matter what we throw at them, they get it done. They are truly fantastic to work with and are a valuable partner in so much of what we have done for SCPRT! My connection to Genesis Studios is both professional and kindred spirit. As an artist and writer, I love working with people who have similar sensibilities. As Marketing Director for Edventure, I can attest that Genesis has delivered products and results of a quality that easily exceeded what we were paying them to do. Together, their creativity, passion for what they do, and expertise has repeatedly enabled us to take our communications to a higher level without the higher cost. I've known the team at Genesis for more than a decade. When the time came for Oliver Gospel Mission to undertake a major expansion with the addition of a women and children's shelter, I knew without a doubt that I wanted to work with Genesis to put together a powerful video and brochure to promote the vision and help us raise the necessary funds. Their people, their work, their work ethic--I can't say enough about how much I truly appreciate Genesis! As Director of Marketing at SAFE FCU, I know what a dependable vendor means. The team at Genesis Studios are extremely professional when it comes to supplying SAFE FCU with the best Marketing support available. They value both time and money and deliver top productions within the stipulated deadline. SCMA has worked with the team at Genesis since our inception. When they quit giving us outstanding service and superior quality productions, THEN I'll consider going elsewhere. It also helps that we just have a great time working with them. They make the work fun! Optika designs exciting and dynamic environments for museums, hospitals, and corporate offices. Since 2007, we have counted on Genesis as an integral partner in delivering the many creative components needed to make these environments come alive. App development, interactive software, design, video production, animation--our work calls on a variety of media, and we can count on Genesis for so many of those elements. 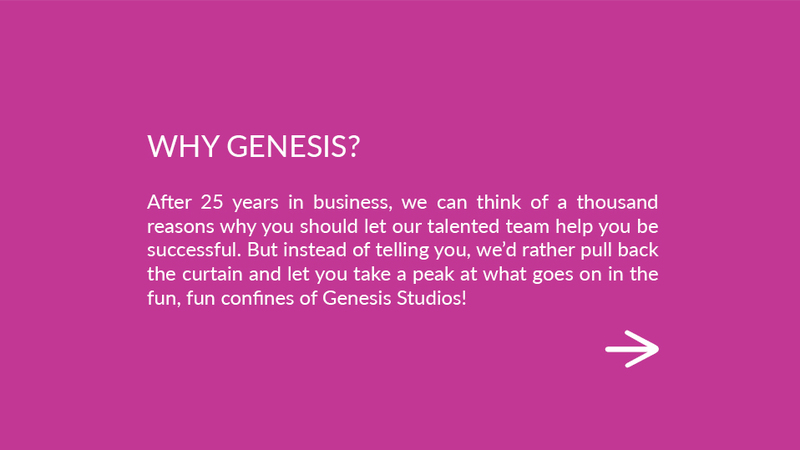 Being able to do so at one place (Genesis Studios) makes our work so much easier! There are just people you "click" with right off the bat--and the entire team at Genesis is that way. They're like an ant colony when they work--everybody knows what to do, how to do it, and they do it so well! They are an integral component of helping Lux & Associates deliver high quality marketing for Newberry Hospital. Mungo Homes has worked closely with Genesis Studios for almost 14 years. That longevity alone should tell you how integral they are to our continued success! The partnership is more like an extension of Mungo Homes. I can always count on Genesis to do exceptional work on time. And it doesn't matter what we throw at them--they're always up for a challenge. We look forward to a long, continuing relationship with Genesis Studios.